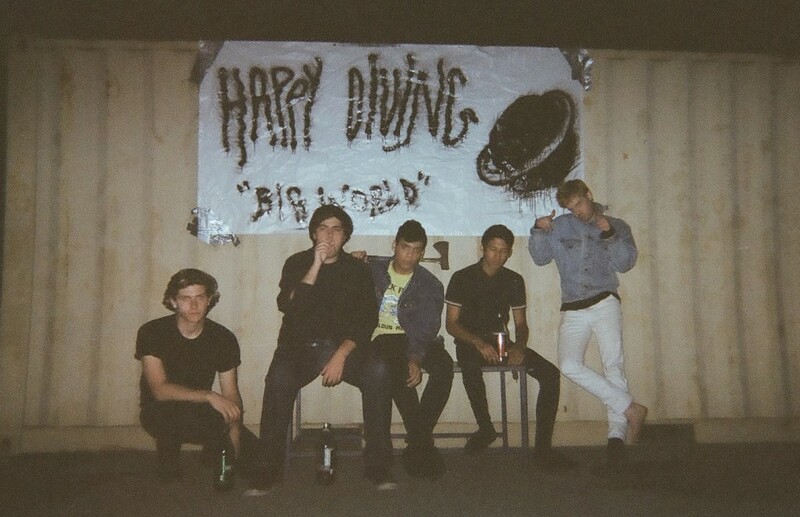 Happy Diving are the kind of band that utilize so much distortion, the tone starts to break off from their riffs ever so slightly. They’re also prone to beginning a large number of their tunes with a plethora of feedback before bashing out their absolutely melodic yet thoroughly pummeling hooks. If this sounds like the kind of record for you, then you’re in for a treat. On Big World, the Bay Area band’s debut full-length, wailing guitar solos slice through walls of sludge while slacker power chords shred along happily. Formed just one year ago, Big World does not sound like the work of a group of fresh-faced musicians, but instead sounds fully-formed upon birth; these guys know exactly what they’re doing and how they’re going to do it. There will be plenty of names to check in the reviews for this album, as the press release notes both Cloud Nothings and Weezer – but you’d be remiss to skip over the noise-pop of Dinosaur Jr. (see: “Big World”), Mudhoney’s textural assault, and even Joyce Manor’s singalongs (see: “Sad Planet”). Producer Jack Shirley (who has worked with the aforementioned Joyce Manor, as well as Deafheaven) cloaks the record with in-the-red distortion and feedback, creating a palpably organic and vintage feel to the whole experience. Anyone who grew up worshiping at the Sub Pop altar will find a lot to love in Big World’s production – you can practically taste the cheap beer and see the ripped denim going on here. I’ve already spent a lot of time giving this album the on-repeat treatment, and honestly this is another example of an instant year-end album for me. Big World runs about thirty minutes long, which is just enough time for it to slap a beer in your hand, push you into the pit for a while and leave you wanting more. This is one album you don’t want to miss. The album is due out on November 4th, 2014 on Father/Daughter Records, and you can pre-order it in Classic Black Vinyl, Oxblood, and Oxblood + Baby Blue Splatter Double Mint Vinyl over at their Bandcamp today.